Aside from increasing your employability and making foreign travel easier; new research shows that learning another language can have a lasting effect on how your brain functions, and this is a good thing. According to research carried out by Pennsylvania State and York University professors, people who speak more than one language are better at multi-tasking and problem solving, and might even be better learners. To explain their findings, lead researcher Judith Kroll from Pennsylvania State University, uses the metaphor of a juggler. “What we’ve learned in the past two decades of research is that each of the bilingual’s two languages is active when bilinguals listen to speech, read text, or plan speech in either language,” explains Kroll. 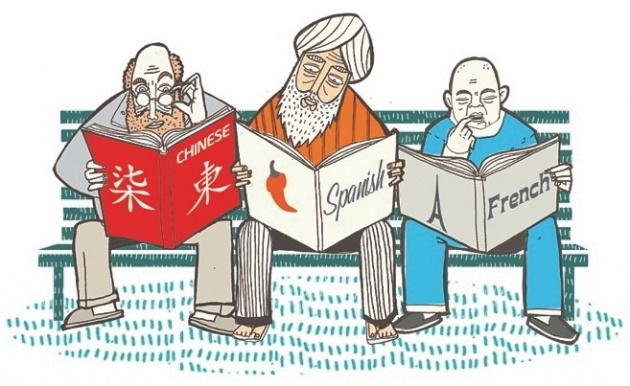 “The bilingual becomes skilled at juggling the competing activity of the two languages. Over time, those juggling skills spill over to affect other cognitive abilities, generally in the domain that cognitive scientists call executive function,” she says. Kroll’s research also dismisses the notion that learning a second language is too taxing or confusing for younger learners, or that people who speak two languages will have difficulty speaking either one correctly. “Although bilingualism may present some additional burdens, the recent cognitive and cognitive neuroscience research suggests that there are more benefits over the lifespan than costs,” she says. She points out that while learning a second language may enhance the development of cognitive control, another possible benefit is that it could make people better learners, certainly of other languages, but possibly even in other non-linguistic domains. Of course, the research is still in its early stages, and Kroll cautions that there is still much that we do not know. “Bilinguals use language in many different ways and we have no compelling account of which aspects of language use produce these changes to the mind and the brain,” she says. But while the exact ways in which bilingualism affects brain are still unclear, we do know that it can give your brain a workout and lead to some long-lasting benefits. And who wouldn’t want that? I find it interesting that evidence suggests a bilingual brain will have better problem solving abilities. I’ve been encouraging my teenage daughter to learn a second language in her education because I’ve heard that it leads to improved overall academic performance. I’m excited to see that becoming bilingual may also have benefits in other aspects of her life!